Summer is here, and that means many of us are gearing up for beach trips! I love a good day (or week!) at the beach, but it does get a little more hectic when there are little ones involved. 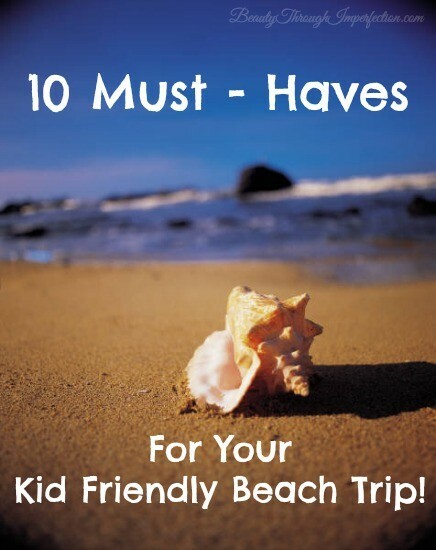 Today, I’ve got 10 things that are essential for a kid friendly beach trip! These will help make the trip safe, easy and fun for every one! This post may contain affiliate links. Inflatable Pool – If you have babies or small toddlers, this one is for you! Bring an inflatable kidde pool and set it up on the beach for them! This way, you can bring the water to them, instead of them needing to brave the waves. We took our first Florida trip when our son was about 7 months old, and this was perfect for him. The pool kept him out of the sand, and we could fill the pool with an inch or two of water for him to play in with his toys. He was happy and content there for hours. Since it’s inflatable it’s easy to travel with as well! This is definitely a must for little ones! Especially if your babies are anything like mine, they will try to eat the sand! 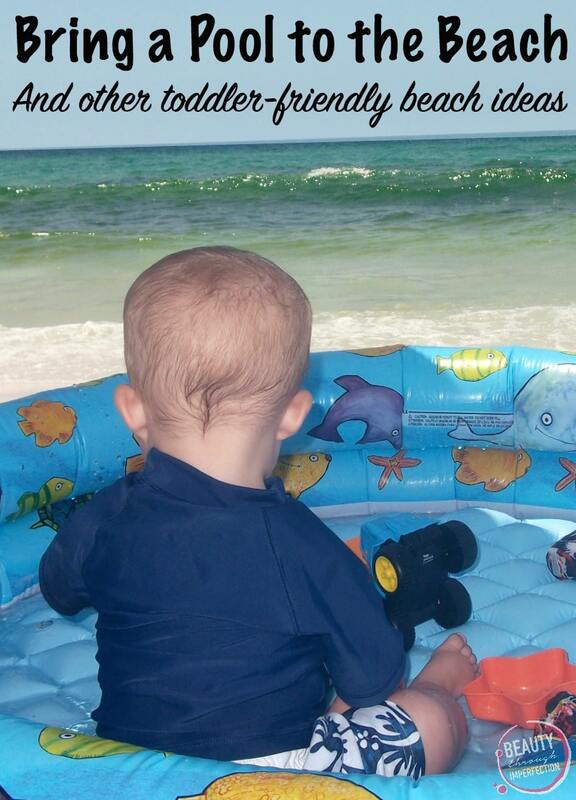 Our little pool saved our son from eating the entire beach! Safety Sticker Tattoos – These are waterproof stickers! First you write your phone number on them and then you stick to your child’s skin. This way if a kiddo wander off down the beach, the lifeguard or some one else who stops them can call you, so every one is not frantically searching for everyone else! We all hope this would never happen, but it’s good to be on the safe side, especially since they are only about $11 for 6 stickers. Each sticker is advertised to last for weeks. Daily Photos or Matching Clothes – At the start of each new day of fun, snap a full-length photo of each child on your phone. This will also help if you get separated, because you can show people the photo of what your child is wearing and exactly what he or she looks like. Dressing all the kids in matching outfits could have a similar affect, if you aren’t planning to bring your camera or phone down to the beach with you. Of course we all watch our kids like hawks and don’t want any one to get lost, but being prepared is always the best strategy! Extra Swim Suits – Each kid needs more than one suit. Expect potty accidents (not just the wet kind!) and all sorts of other shenanigans to happen. Bringing extra suits with you to the beach will keep you from paying crazy prices in the tourist shops! Loads of snacks – Being in the sun all day makes you hungry! I try to pack snacks that are easy to eat with two fingers, since every one (and everything) will be covered in sand. Prepackaged crackers with cheese or peanut butter are one of our absolute favorite beach snacks! Every one can get their own pack, and the extra protein in the peanut butter helps get your energy back up. Waters – I’m totally that mom that forgets to bring sippy cups of water to playdates throughout the week. It’s okay for an hour long playdate, not so much for a day at the beach! Purchasing a few larger water bottles (like these ) make life much easier. Sippy cups hold such a small amount of water, and little ones often struggle drinking from a normal water bottle, so I prefer the “adult” version of the sippy cup for every one when we’re beach bound. Plastic Bag for the Camera – If you have a small point and shoot, bring a ziploc bag to keep it in! It will probably be bright enough outside that you won’t need the flash, so you could even shoot some photos through the clear plastic so you don’t have to worry about it getting wet or covered in sand from your hands. Baby Powder – This is like magic! Rub baby powder on every one and the sand comes right off! It’s truly amazing! It works best on dry sand/skin, so don’t try this fresh from the ocean. Wait until the end of the day when every one is drying up and do it just before you hop back in the car. Can you imagine a beach trip where you don’t end up with sand in your car for the next 4 months? Hooray for baby powder! Aloe lotion (not the gel!) – Think ahead and bring that aloe vera lotion! I know that the gels are very popular, but a fire fighter friend told me that lotion is actually much better for burnt skin than the gel. This is because the aloe gel acts like a blocker and actually locks the heat in and doesn’t allow your skin to heal. (Yikes!) Lotion on the other hand, seeps down into your skin to heal it, while also letting the heat get out, so you have a better chance to keep the tan and not peel! 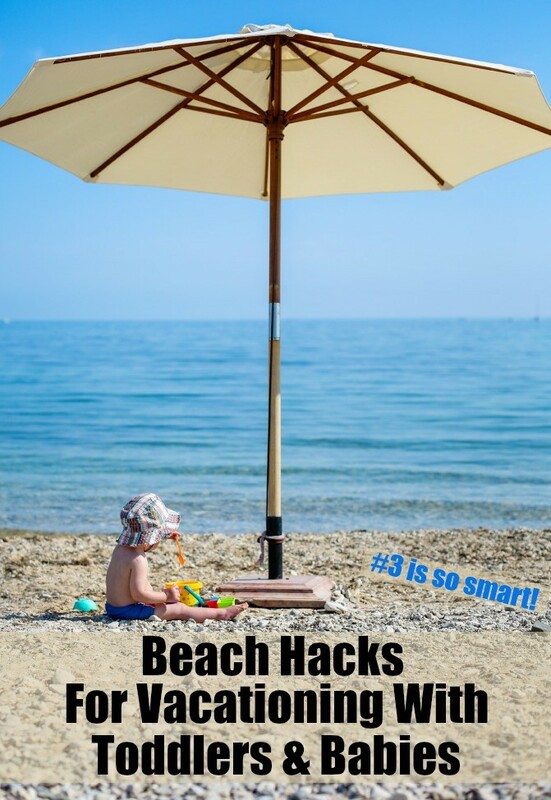 Have you ever tried any of these ideas on a trip to the beach with your kids? What are your best tips for beach days with small kids? I’d love to hear them! Looking for snacks to take on your beach trip? Try over 100 of the best travel food ideas here! Lots of tasty kid-friendly options! I like to put my phone in a ziploc too! Keeps the sand from getting in all the tiny spaces. I love the idea of a daily pic of the kids too, such a great idea! Oh my gosh! I LOVE the inflatable pool idea! That is genius! Where were you when my kids were tiny? Great list, thanks for sharing!!! We’re leaving for our beach vacation tomorrow, so these are perfect. Love love love the tip about taking a picture each day! We bring 2 gallons of water with us for rinsing in case there aren’t showers available. Helps to get that nasty salt water film off the skin for the trip home. I have also read about putting your valuables (wallet, phone) in a diaper. Who would want to steal a dirty diaper? Utter brilliance! Blow up pool? Genius!! Baby powder? Fantastic for any age! We are well past the blow up pool age, but baby powder is going in the bag for the next beach adventure. it’s been a long time since my son was this little (he’s 9). However, I learned this when he was 2 and we moved to the beach. The built in underwear in swim suits ALWAYS cheaffs him. A friend suggested that we purchase competition style jammers to where under his trunks. Life savers! Now he is a competition swimmer and still wears the jammers to the beach the protect his skin. I had NO idea about the baby powder tip and will be sharing this far and wide! I would think that the Aloe gel would be better than the lotion…the gel soaks in the lotion is more of a barrier that would trap the heat in…it contains some sort of oil. 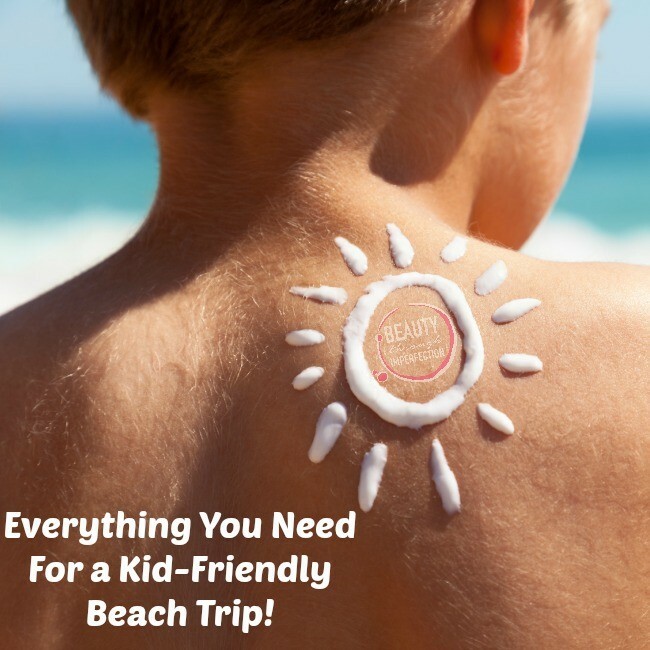 Hey Buddy!, I found this information for you: "10 Essentials for a toddler friendly beach trip". Here is the website link: https://www.beautythroughimperfection.com/kid-friendly-beach-trip/. Thank you.